I love grilled doves. Doves and squab, which is a domestic pigeon, are generally low in fat but tender, so they grill really well. Normally I make Doves a la Mancha with my first hunt’s worth, but after that I really like a good Cajun or Creole spice rub on my doves. 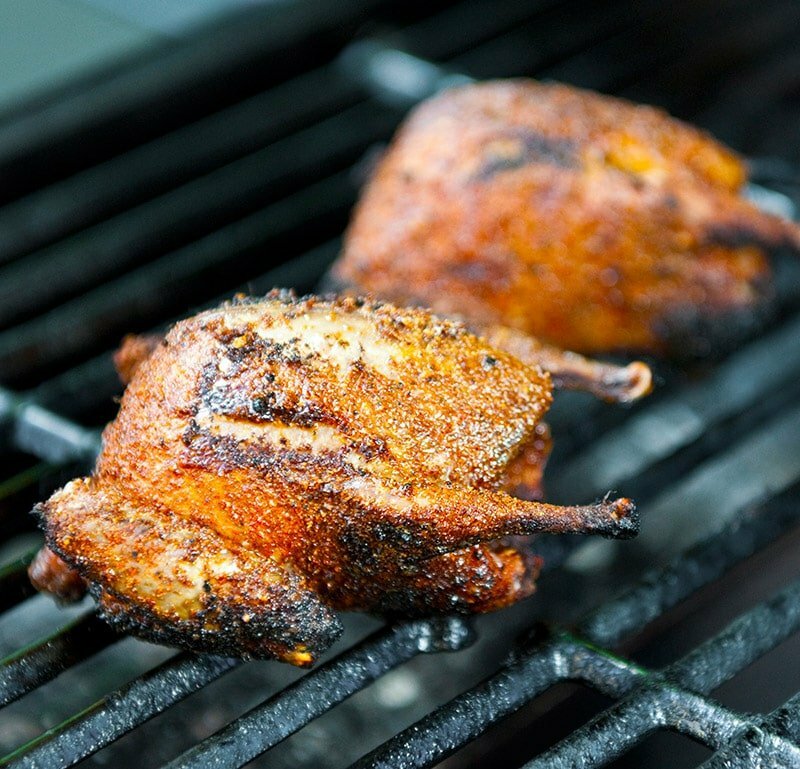 This recipe is ridiculously simple: Toss doves with the spice rub. Let them sit awhile, then grill over high heat until the skin is crispy and the meat is cooked. You can substitute literally any spices for this. Porcini powder is a good one, and so would French quatre epices. Hell, even lemon pepper or that standard Italian seasoning you see in stores would work. Experiment. One thing: Please use whole doves here, not breasts. Doves and pigeons are so easy to pluck it is a crime not to serve them whole. Coat the doves in the oil, then toss in a bag or plastic container with the spice rub. Let the birds sit in the fridge for at least an hour, and up to a day. When you are ready to cook them, get the grill hot, but leave a cooler spot where there are no coals underneath, or, if you have a gas grill, turn off one burner. Make sure the grates are clean, and right before you put the doves on the grill, wipe down the grill with a paper towel soaked in vegetable oil. Use tongs to do this. Put the doves or squab, breast side up, on that cool side of the grill for 5 minutes with the grill cover down. Move the doves to one side -- you're searing the wings and legs here -- and grill over the hot side of the grill (with the cover up) for 2 minutes, or until the side is nice and browned. Repeat on the other side. Finally, flip the doves so the breast is facing the flame and grill for another 1-2 minutes, or until the breast is nicely browned, with a little char on it. Let the doves rest for 5 minutes before eating. Serve as an appetizer before some wild game dirty rice or a wild game gumbo. I do similar with them. I like to use olive oil and then season well. I also prefer to split them down the middle. When you say get the grill hot how hot are you talking? Travis: Dunno, never measured. But hot enough so you can’t hold your hand above the grill for more than a second or so. Hank – A colleague’s dad just hunted a whole bunch of doves down in Maryland. I’m a chef, but have never cooked doves. I won’t have grill for another week (I live in NYC) and was wondering if I could freeze the doves for a week or two? Chris: Yes, if they are plucked.